In the post about free-form questions, I have not found the answer to creating prerequisite questions. I need my learner to complete three text fields before beginning a quiz. How do I set variables for text field (name, email, date) before allowing the learner to click a start button for the quiz? I have set the button variable to change states when true but don't know how to set the variables for the test entry fields. You would set a condition on your button so that each Text Entry fields is not equal to, ignore case blank. I've attached a rough example for you. One thing to note with this is that the variables behind a text entry field doesn't update until the 'control loses focus' meaning that the user clicks somewhere else on the screen... This means that if I enter all three text fields the button will still be disabled until i click somewhere else. I guess you just need to decide if that's an issue. Hope this helps. Someone else might be able to chime in with a better solution. EDIT - W Gill's a faster typer than me :) I can see they've already provided a solution. There are a number of ways you could achieve this. Creating a text box automatically creates a variable (TextEntry1, TextEntry2, etc.). You could add a trigger to the Begin button that require certain conditions of those variable to be met in order to proceed. Give each variable a default value. Jump to next slide when user clicks Begin on the condition that TextEntry1 does not equal Name AND TextEntry2 does not equal Email AND TextEntry3 does not equal Date. 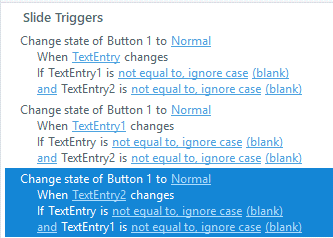 This would require users to change the default value of each text box/variable in order to advance. Does that make sense? Again, there are a number of ways to set this up. START. This should ensure the lost focus isn't a problem. "Do the right thing, even when it isn't popular." text. Do I need to set the default value of the textbox content? When you create the text entry boxes their variable value should default to blank - so this shouldn't be an issue. Without seeing your file it's hard to say what the issue is. Are you able to upload the .story (even just for this one slide) here and I can look at it? Cool - not sure if it was meant to be attached to your last comment (it's not). But once you upload it I'll see what I can do.